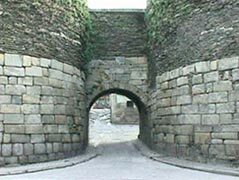 Roman wall of Lucu Augusti, Lugo. 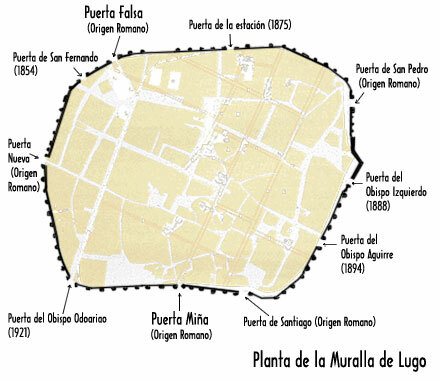 Roman city was surrounded by a wall with a rectangular plan with round angles. Its building -design and construction- follows the Roman rules for fortifications and occupies an area of 35 ha. Total perimetral lenght is more than 2.100 m. but width is different at different parts: from 4 to 7 m. It made a good communication between its 85 watchtowers. Distance betwen them oscilates from 9 to 16 m. The whole was from 8 to 12 m. high. Towers had a semicircular plan though 11 are rectangular. 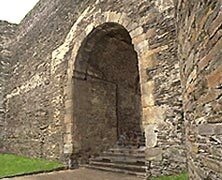 They were all crowned by other towers that open its doors to the corridor of the wall and some windows with a semicircular arch -tower of A Mosqueira-. It gave advantage in front of the enemy. Plan of tower with an inner staircase with a shape of "T"
It is built with granite ashlars placed without mortar at the doors and close to them. Parts of the wall were generally made of pieces of slate. 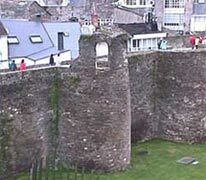 Inner of these protective walls was composed by stones and earth. It has suffered many spoilts because of warlike reasons, restorings and rebuildings with a different fortune. Almost all the doors have been changed: only the Minna door is outstanding. It keeps it Roman craft, consisting of ashlars at the basis and pieces of slate at the top. Original Roman design showed four main doors and one for maintaining -the actual false door-. Later five new doors were built: four during 19th century and one at the beginning of 20th century. 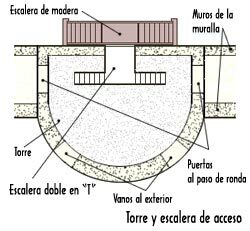 To reach the upper part of the wall -wall of ronda- there were double staircases with a shape of "T", placed inside the defendance towers. Today four staircases can be seen. They were built at the Middle Ages. A pit 4 ms. deep and 20 ms. wide was built at the exterior part. It was parallel to the wall at ca. 5 m. from it. Inside the walled area an intervallum, i.e. a kind of street for rapid communication, special for charriots or troops, was designed. This wall is today very well preserved. Doubtless is the best preserved at the Iberian Peninsula, since it is a reliable copy of the original one. There remain 46 complete towers and 39 almost complete.